House, 4 Bedrooms + Office, 3.5 Baths, (Sleeps10) Kids room. 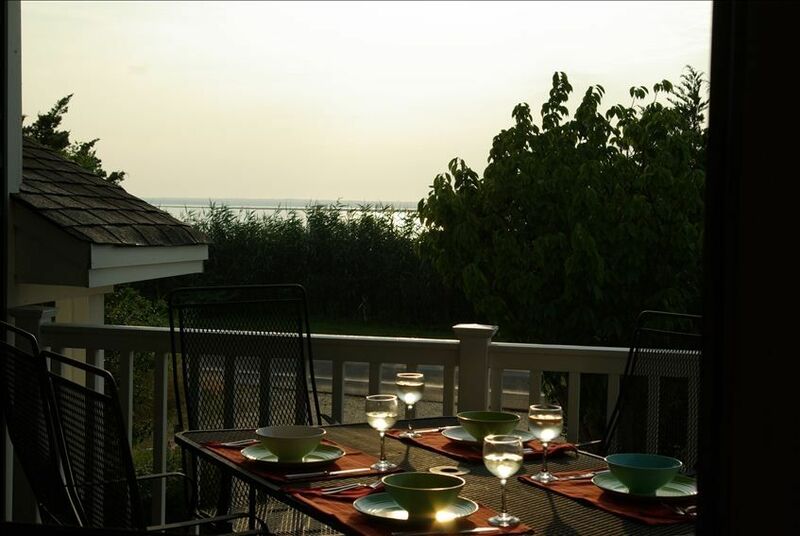 Picture yourself relaxing on the deck after a delicious meal enjoying the sun setting on the Bay. The water sparkling like diamonds. Kids playing outside or walking down to the bay beach (2 short blocks south of us) to play in the sand as the sun sets. ERG Concept 2 rowing machine on site!! We have 2 Master Bedrooms and 1 Kid Suite (no bathroom but 2 rooms for the kids to enjoy) that sleeps 5 with bunk bed and mattress under that as well as daybed with trundle. 4th bedroom has daybed with trundle that converts to a king (bridge to convert on site). 37' Flat LCD TV with Wii Gaming system with some games included in kids suite. Like to read? We have a nice collection of book for kids and adults. Office with desk and chair and magnificent view. Keywords: Water views, Barnegat Light, Viking Village, chefs kitchen, close to beach, kid friendly, private, 2 Master Bedrooms. Great for 2 families to enjoy. We are an active family and adventurous. We love to travel but also love the familiarity of coming back to a special place. Newly ADDED! CONCEPT 2 ROWING MACHINE IN BASEMENT!!! We just added new 65" Smart TV, New Grill, New Deck Furniture, New Stove, New heavy duty Adirondacks, New sofa in kids room. We love the convenience of walking 2 short blocks to the ocean and not being packed like sardines on the beach. we love getting up and taking a morning run down to Harvey Cedars while coffee is brewing. I love to have my morning coffee on the deck and watching the birds get breakfast as well. Our favorite dinner is at Off the Hook at Viking Village. The Kids suite is unique, a great place for the kids to chill while the adults can relax and have some down time. Having 2 master bedrooms is wonderful. when our family comes we never feel cramped. they have privacy as well. a wonderful feature. Lg walk in shower and separate huge roman soaking tub. Concept One Rowing M/C in basement. Deep sofas that are wonderful to curl up on. Domain slip covered. Blender, ice shaving, salad spinner, Keurig as well as Regular drip coffee. Lemonade urn. Extra large dining table. Seats 10 easily great for family style dinners. off of office upstairs. great perch to view sunsets. Covered Deck with Dining table and separate bench. Tennis Courts in Barnegat Light (can rent them easily) as well as Loveladies Tennis Courts with instructors. 8 Beach badges included in rental, fully equipped kitchen, outdoor grill baskets, 2 blocks from Viking village where the fresh catch is brought in daily. produce available there as well. Far enough from Village that you cant see it or hear it. secluded feel but close to anything on the island. Ask about towels and sheets if you need them. Kids suite has room for 5, bunk, daybed with trundle and trundle under bunk. Wii gaming system with small amount of games. 4th bedroom has a daybed with trundle that can be converted into King with a bridge we have on site. Office has pull out twin mattress in Chair. outdoor shower!! Change over day for all Summer season rentals are Friday to Friday. Dates reflect start date on Friday and includes following Friday check out. Easy access to keys and check in at a Realtor on the island. Standard rate is for non-seasonal dates. Does not apply to in season! Please contact me by v2j2rl@Gmail.com or my phone number, 908 9380707 just leave a message. Pay no extra fees from VRBO. I book on island and will forward your info. thank you.